Challenge the Master by playing with it - or against it! Your routines while practicing darts will never be the same as this is the ultimate tool for scorekeeping and practice games! Now you can play all of the 01 games and even cricket against computer opponents at 7 different skill levels! No more chalking, counting, or worrying about having dart supplies around the house - just punch in your scores and your results will be displayed instantly. 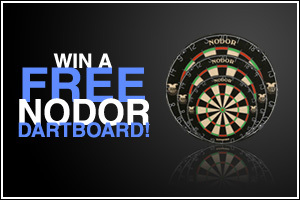 The Dart Master even shows you your points per dart average and total number of darts thrown at the end of each game. 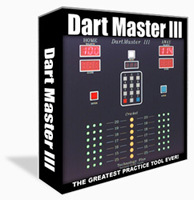 Level 1: Dart Master will finish in 9-18 darts. Level 2: Dart Master will finish in 12-21 darts. Level 3: Dart Master will finish in 15-24 darts. Level 4: Dart Master will finish in 21-30 darts. Level 5: Dart Master will finish in 27-36 darts. Level 6: Dart Master will finish in 33-42 darts. Level 7: Dart Master will finish in 39-51 darts. Each level is random so you never know what you're going to get. If you choose level 3, for example, the Dart Master will throw no less than 15 darts and no more than 24. This is a good measure as to how consistently you can finish because you know for a fact that you'll have a maximum number of darts to throw. Depending on your ability, you might choose to play at one level until you can consistently win and then move up. For example, if you are close to beating Level 3 but can't quite do it yet, move down to Level 4 and beat up on it for a while. There's no shame in consistently throwing 21-30 darts to finish a game and that would put you at a Low-to-Mid "A" level of competitive ability (at least in the pub leagues, anyway)! Play any 01 game such as 401, 701, 1001, etc. Play double-in/double-out (301) at 7 different skill levels. Play cricket at 7 different skill levels. Displays your points-per-dart (PPD) average and how many darts you have thrown once the game is complete. This is a great feature because even if you find that you are losing at a given level you'll still be able to see how consistently you are playing. Consistency is the key! One of the greatest things about the Dart Master is that it makes chalking obsolete. No more worrying about having chalk and an eraser handy or cleaning your chalkboard - just press the buttons and the Dart Master does everything for you! 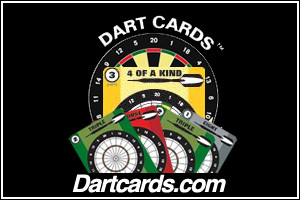 It goes without saying that once you've used the Dart Master you'll wonder how you ever got along without it. The only feature that we'd like to see added would be a mechanism that records your matches so that you could print them out and evaluate your performance over time. As it stands, you'll still need to record those yourself if you want to track your progress. Includes a 3 Year Warranty issued from the manufacturer. This item currently sells for $399.00 in most retail stores. For Canadian purchasers, click the "Buy Now" button above to go to a secure payment site. Pay with: Visa, American Express, MasterCard Bank Transfer or PayPal. To pay by cheque contact us. If you are outside Canada contact us for pricing in your home currency and for shipping costs. This article is copyrighted material and is the property of Torontodarts.com. Please do not re-use or-repost in any manner without express written consent of this website.